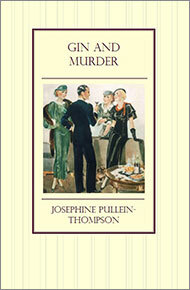 Josephine Pullein-Thompson’s GIN AND MURDER is another of the titles I procured last year from Greyladies Press. Why? Because of the cover. I love the clothes everyone is wearing in the picture and the scene looked so inviting I immediately imagined eavesdropping on those people having a lovely time at their cocktail party. The book delivers on this basic promise: there is a party at which gin cocktails are consumed and idle gossip is shared. There is also snobbery, hunting, two murders and some gentle humour. Apparently Josephine Pullein-Thompson is better known for writing “pony books”. She and her two sisters wrote dozens of the things, aimed at children and spanning several decades. It shows. Even though this book has horses rather than ponies, as befits a book for adults, there is rather a significant focus on things equine. I wasn’t a pony girl nor am I a horse-y adult so this element left me a bit confused on occasion but I did get a few chuckles out of it. There’s a sequence in which some old duffer loses track of the hounds the hunt group he leads is meant to be following and I liked the imagery of both fox and hounds getting one up on the humans. The rest of the drama, such as it is, centres on the hosts and attendees of Friday night drinks at the home of Elizabeth and Charlie Chadwick. Undercurrents of discontent amongst the acquaintances present become more evident when Guy Vickers, one of the attendees, dies suddenly. When it is clear the death was not from natural causes suspicion quickly falls on hunt master Mark Broughton as he’d fallen out with Guy. However there are another half-dozen people making up a very toffy suspect pool. Initially the person working his way through these suspects is ‘the local man’ but he is soon shunted aside. At this distance it appeared his only sin was being too common for the upper crust to deal with, but in the confines of the story the Scotland Yard man had to be brought in due to superior intelligence. DCI James Flecker, who is smart but dishevelled and absent-minded, and his less forgetful sergeant work their way through the case with equal amounts of bravado, guesswork and insight. Though not before another murder occurs. One thing that did stand out for me was the depiction of the Broughton family which includes Mark’s alcoholic wife Clara and his orphaned niece and nephew. All of these elements are sensitively incorporated into the story while displaying a kind of pragmatism that befits a time that is still considered post-war. The uncovering of the reason for Clara’s alcoholism is rather poignant. A family grouping of this kind transplanted to today would all be in therapy and/or the subject of multiple visits by social services. I’m sure GIN AND MURDER offers a very realistic picture of a particular world. I don’t know the first thing about that world but am confident Pullein-Thompson does and that she has drawn it very well. The book offered a perfectly delightful way to while away a blisteringly hot summer afternoon with my own gin cocktail to hand (purely for mood setting of course) and I can’t complain if it hasn’t seared itself into the long term section of my memory. There’s a lot to be said for a pleasantly entertaining diversion. This entry was posted in book review, Crimes of the Century, England, Josephine Pullein-Thompson and tagged 1959book. Bookmark the permalink. There certainly is a lot to be said for a book that’s pure entertainment, Bernadette. And I’m glad you enjoyed this one. It’s good to hear that, besides the context and mystery, there are also some solid character depictions. I think that does add to the story. The Pullein-Thompson pony books were everywhere when I was a kid — I even read one or two on one of those ghastly family holidays where I ran out of reading material and the only things anyone could find were, oh wrist-slit, girl‘s books. It’s only fairly recently that I’ve discovered she did a few ‘tecs as well, and I’ve been curious about them. Your review, which made me grin, suggests that investigating the Pullein-Thompson mystery oeuvre need not necessarily be, ahem, at the frontline of my priotrities. No I don’t think you’re missing out on too much by focusing on other writers. I suspect the pony books did not have a huge following in Australia, where horse people are restricted to a few very small enclaves. That is a very nice cover. The story sounds interesting and I like the title. I would not mind trying it were it more easily available. I do like to support groups like that but I have decided that I will make an effort to get some books by Australian Women Writers whose books are not easily (or affordably) available in the US. So that is where I will put my extra outlay this year. It would be hard not to like this book I think, even though I suspect it’s not one that will generate deep and abiding love. But that’s OK – not every book has to be like that. I don’t think my brain could cope with that.